Palisade  is in the Northwestern part of the Rocky Mountains state of Colorado near Grand Junction. 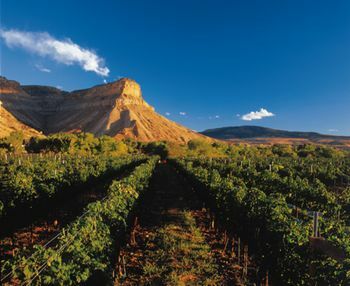 Palisade is perhaps most famous for its fruit orchards and the vineyards that comprise Colorado's Wine Country. Founded in 1904, Palisade is an area of breathtaking beauty and agricultural bounty. Named for the austere and dramatic stone palisades of Mesa Verde Sandstone and Mancos Shale north of town, this sleepy farming community is surrounded by mesas of all shapes and sizes. Looming in front of the town are the dun-colored bluffs of the Bookcliffs, also known as the Palisades. The Bookcliffs form many different pillars, boulders and hoodoos that balance in seemingly impossible positions along Interstate 70. Palisade is peach country, home to the eponymous Palisade Peach. Over 75 percent of Colorado's wine grapes come from Palisade, and the town is home to over a two two dozen wineries. Most visitors come in the summer months, or early fall when the grapes are being harvested. The best times to visit Palisade are May, June or September. The weather is mild and there are an abundance of outdoor activities to enjoy. The town is probably best known for its three big festivals, Palisade Bluegrass and Roots Festival , Palisade Peach Fest , and Colorado Mountain Winefest . There is an informal, rustic charm to this small town. Historic Victorian gingerbread houses line the road into town, while Main Street offers a "Norman Rockwell" setting. Most of the inhabitants know each other by first name. Travelers can experience this camaraderie first hand at the summer farmer's market, held downtown on the weekends. The market features local musicians, artists and fresh produce. The changing seasons bring something different for visitors to enjoy. The fruit trees blossom in the early spring, the grapes hang heavy on the vines at harvest time, while the grape leaves turn red and orange in late fall. Palisade is the perfect coda to the more frenetic and higher-priced ski resorts of Aspen or Vail. Visitors can relax on the front porch of a local inn or bed and breakfast, sip fine wine and enjoy the scenery, all without breaking their budgets. You're going to have to rely on neighboring Grand Junction, just 10 minutes away by car or taxi, to fly into Palisade. Grand Junction Regional Airport , (IATA: GJT, ICAO: KGJT), otherwise known as Walker Field, is served by six airlines with nonstop service to Dallas/Fort Worth, Denver, Salt Lake City, Phoenix, and Las Vegas. Some service is seasonal. For private pilots, it is also possible to fly your small plane into the airport and leave it while you tour the area. Taxi service is also available at the airport. Car rental at Walker Field includes Advantage, Alamo, Avis and Hertz. Taxi service is also available at the airport. Palisade is on Interstate 70, about 40 minutes east of the Utah border and 4 hours west of Denver. Amtrak  serves nearby Grand Junction with the California Zephyr , which runs daily between Emeryville (in the San Francisco Bay Area) and Chicago. Greyhound Bus Lines is located at 230 S 5th St, Grand Junction - +1-970-242-6012. But if you're without a car, you'll still need to hail a cab into town. For extreme mountain bikers, it's possible to follow the Kokopelli Trail from Moab, Utah, then join up with the the Colorado River Front Trail system and bicycle all the way to Palisade. This is a five or six day, strenuous excursion where you must pack in your own food, shelter and water. The downtown area of Main Street is small but charming, and easily navigated on foot. The wineries and orchards, however, require a bicycle or car to visit. The primary thing to see in Palisade are the town's orchards and wineries. For more winery information, see Colorado's Wine Country. Healthy outdoor activities comprise the lion's share of fun things to do in the Grand Valley. Most of these activities will take place on one of the surrounding mesas. On top of the Bookcliffs roams a herd of federally-protected wild mustangs. It’s possible to visit them and see this symbol of the Wild West. The Bookcliffs culminate in Mount Garfield, an icon of the Grand Valley, majestically rising above Palisade's vineyards. There is an arduous yet extremely rewarding trail to Mount Garfield's summit. To the east of town lie the verdant evergreen slopes of the Grand Mesa, largest flattop mountain in the world, and home to many great activities such as skiing, hiking, fishing and horse back riding. (No fall trip to the mesa would be complete without a drive to see the changing aspen leaves). To the south of Palisade are the red sandstone formations of the Colorado National Monument. You can drive to all these mesas. They are also interlaced with a variety of hike-able and bike-able trails. Bring your camera. All these rocky formations provide a photogenic setting that frames the irrigated farm land on the valley floor. There are over a dozen wineries in the Palisade area to visit. Packing Shed, 349 W 8th St.(970) 464-9202‎. This is a restaurant in a historical home, close to the starting point of many rafting excursions. Steak and seafood are popular choices on the menu. Additional lodging options can be found in the nearby towns of Fruita, Clifton and Grand Junction. Most Starbucks, hotels and coffee shops throughout the region offer wireless Wi-Fi access. But if you don't have a computer, try the public library in Grand Junction. Neighboring Grand Junction is worth seeing. Palisade can also act as the hub for a series of day trips to Telluride, Aspen and Vail, as well as Black Canyon of the Gunnison National Park, Canyonlands National Park and Arches National Park. This page was last edited on 9 July 2015, at 22:12.